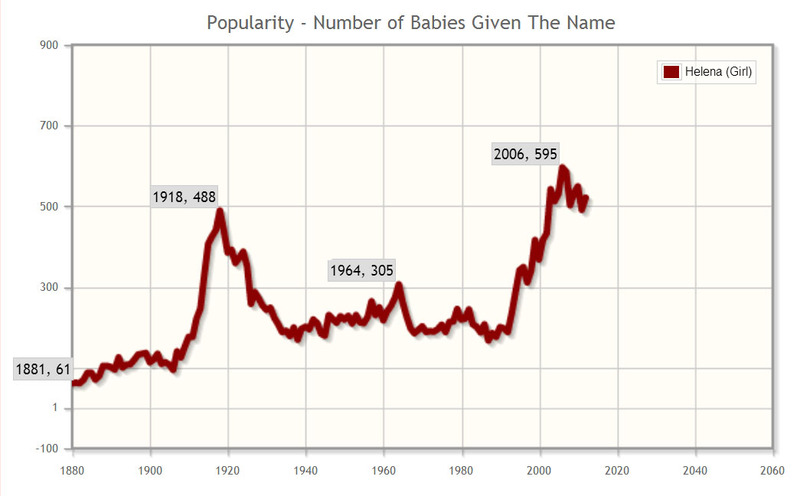 Are you trying to find the perfect baby name that has history and class? Many parents find themselves looking to the past. Names that were hot for our grandmothers and great-grandmothers are now turning the corner and becoming fresh and new again despite being classified as "old lady" or "old fashioned" names before. Perhaps the perfect name for your daughter is on the list below! Take a look and see if you find any that you like. They are all wonderful options. Check out the "Naming Services" tab above if you'd like more information about a certain name or if you'd like an outsider's opinion on which you should go with! I can help you narrow down your choices statistically! Enjoy! Some of these are obviously more popular today than others. What do you think of the list? Are there any more names that you'd like me to add? 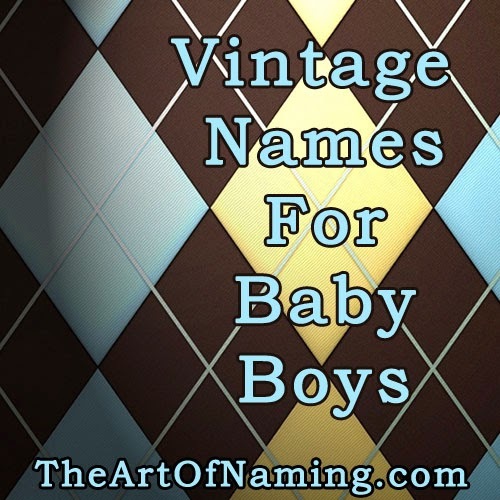 Don't forget to check out the list of Old-Fashioned, Vintage Boy Names too! 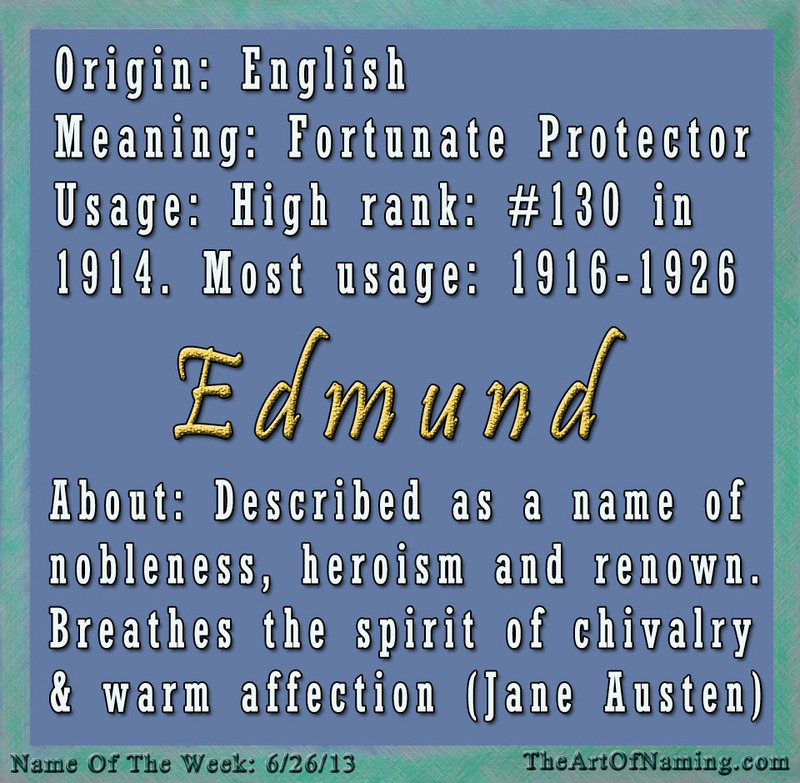 The Boy Name of the Week is Edmund! 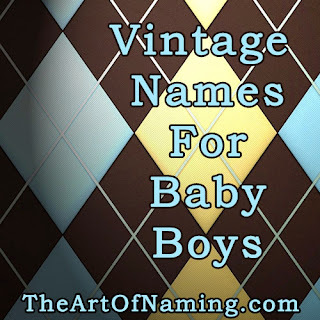 It was recently featured on my list of old-fashioned, vintage boy names. Edmund is a cool and classic choice that would be handsome on a little guy today. 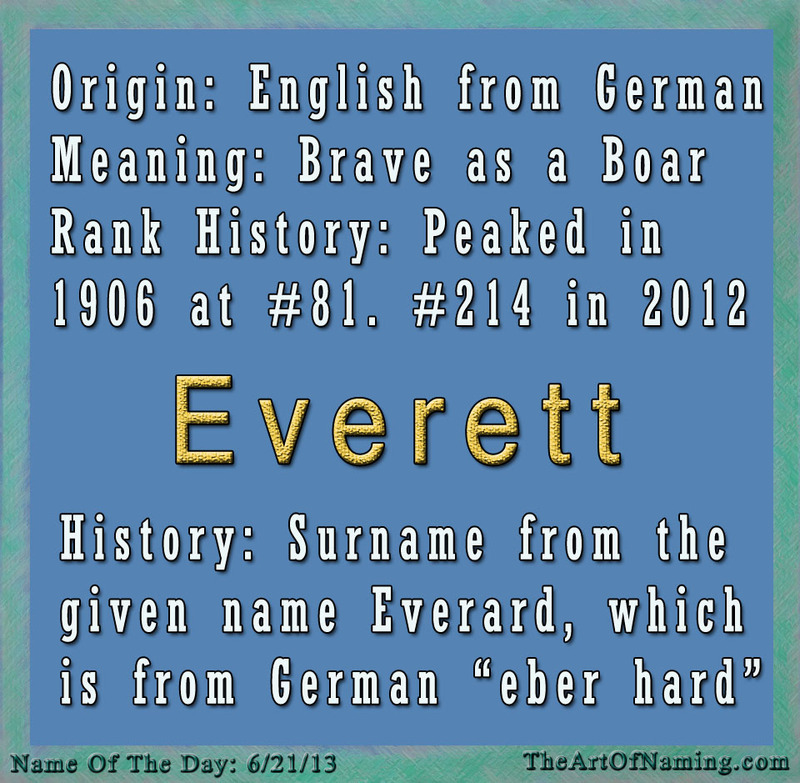 It is a sophisticated English name meaning "fortunate protector." I like the spelling Edmund more, but there is also the French form Edmond. I do like the Irish variation Eamon as well. 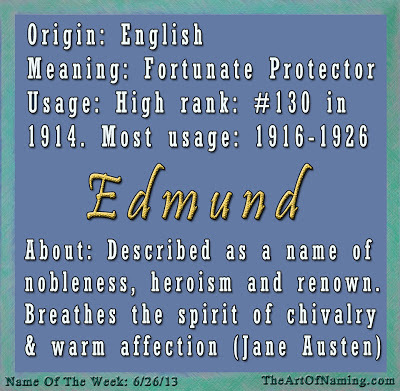 Not very many names have a popular, historical quote written about them, but Edmund does. In Jane Austen's book "Mansfield Park," the character Fanny says "There is nobleness in the name of Edmund. It is a name of heroism and renown; of kings, princes, and knights; and seems to breathe the spirit of chivalry and warm affections." And the poet John Keats once said, "Had my name been Edmund, I would have been more fortunate." I would say that is a mighty fine testament to the name! 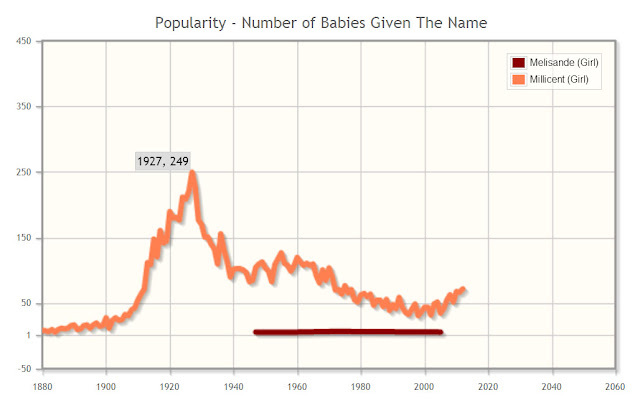 If you're considering naming your little prince Edmund, you may want to know more about its statistics! 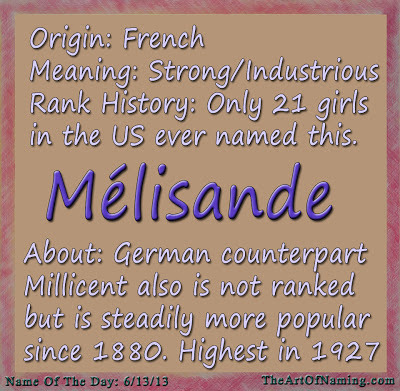 As far as ranking goes, this name was ranked the highest in 1914 at #130 on the US Top 1000 chart. 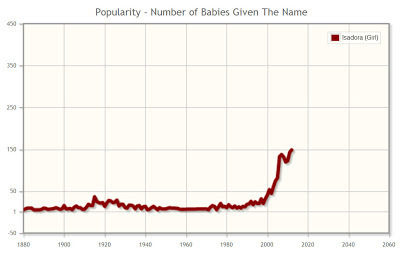 In that year, 792 babies were born with the name. However, there are several years that have more births but a lower ranking. I like to gage popularity more by the number of births than the rank. From 1916 to 1926, Edmund was at its peak! 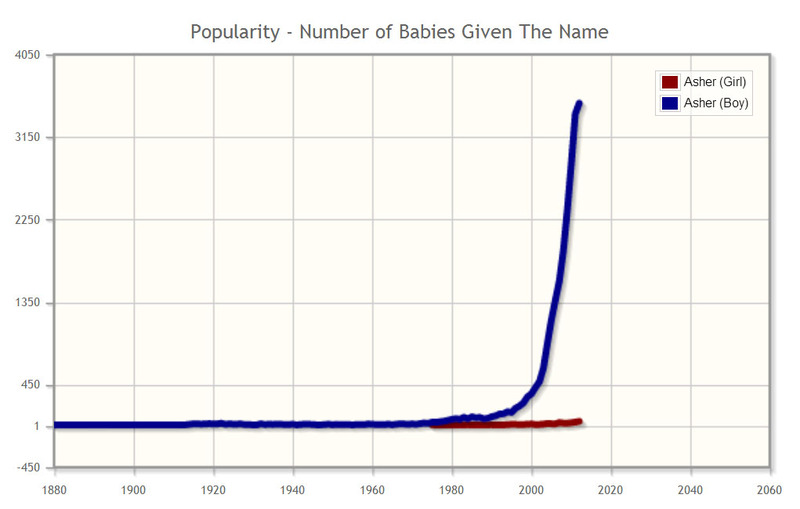 It averaged just over 1000 births each year. Since then, Edmund was steadily used for 500-600 babies per year until usage declined in the late 1960s. 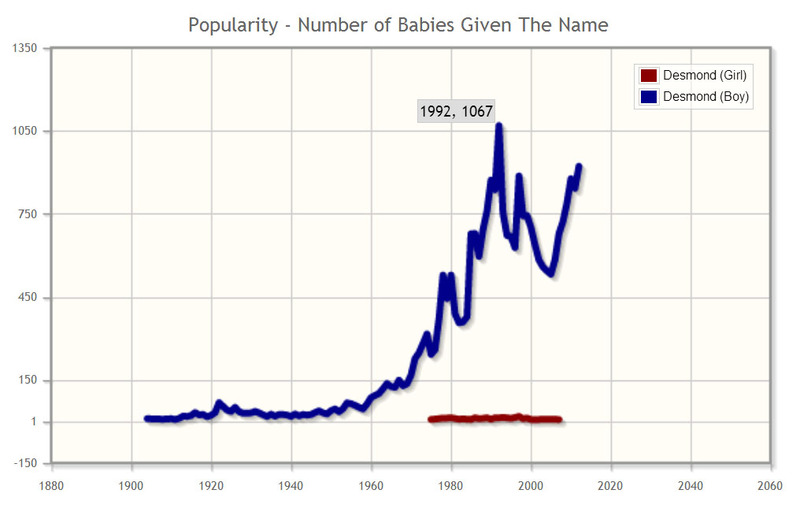 Since the 70s, there has been a steady average of 120-250 births per year or so. Aside from decent numbers in the 1920s, this name has never been all that popular. 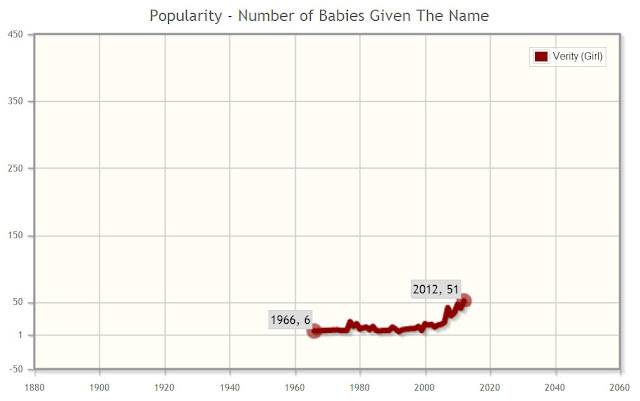 In 2012, there were only 133 Edmunds born, ranking the name at #1295. It hasn't been in the Top 1000 since it ranked #924 in 1997. Do you think this is a name that deserves to be revived or is it just too old-fashioned? With the recent popularity of similar-name Edward, I would like to see more little Eddies on the playground. What do you think? Some people are beginning to wonder if these bookmakers know something that we don't. William and Kate have stated that they do not know the gender of the child and are not going to find out until it is born, but the bookmakers have the odds set at 2-7 for a little princess, and only 11-2 for a prince. This may be based on a slip-up from Kate where she very nearly said "my daughter." The girl name with the best odds is Alexandra at 5-2. This seems to be the most popular choice all around and it happens to have been my first choice before I ever saw the odds. Queen Alexandra sounds beautiful to me! In second place is Charlotte with 4/1 odds, which is the middle name of Kate's sister Philippa "Pippa" Middleton. Charlotte is also a feminization of Charles, who is William's father. This name has become a popular choice to bet on recently, as odds have changed from 12-1 to 4-1. Elizabeth, the name of William's grandmother and the reigning Queen of England, is ranked at 5/1 odds. However, I have doubts that they would want to purposefully place another Queen Elizabeth back on the throne so soon. Personally, I would go for a different name to avoid confusion ("which Queen Elizabeth?") even though they do sometimes choose an entirely different name to be known as. Diana is ranked in 4th place with the odds of 6/1. While Diana is the name of Prince William's late mother, this is not a historically royal name (it has no royal antecedents.) Also, since the accession rules have changed, William and Kate's firstborn will be the heir no matter the gender. With lingering mixed-feelings about Diana's inharmonious history, it truly does not have a good chance of first name usage. However, I would bet on Diana being one of the child's multiple middle names. More odds include Victoria (7-1), Mary (10-1), Eleanor (12-1), Alice (14-1), Anne, Frances, Grace and Sophia (20-1) for girls. For boys, the number one name on the bookmaker's radar is George which ranks at 12-1. George is my top pick for a boy. It is a handsome and strong regal name, the name of Queen Elizabeth's grandfather. Next would be Charles (William's father's name) ranking in at 25/1 along with James, John, Louis and Phillip (the name of Queen Elizabeth's husband, William's grandfather.) These top boy contenders are very handsome and have a solid history. I would be happy seeing any of them used, but I have to say that I don't think Charles will be chosen as a first name. 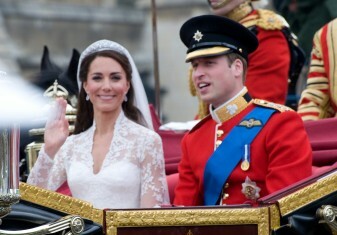 It just seems a bit too soon to have another Charles since the current Prince Charles is first in line to the throne. Other boy names that I'd like to see used include Albert, Alfred, Arthur and Frederick. What do you think? Place your bets on the first name, and just for fun, throw in some middle names that you'd like to see used! My bets: Alexandra and George. That was extremely difficult to decide upon. I even looked at all of the immediate relatives' names to see which names haven't been used very frequently and which have. However, if they don't go with the most traditional and obvious choices that the family always seems to use, I'd love to see something slightly more unexpected like Alexandra Eleanor Diana Margaret or Alexandra Isabella Matilda Jane. And for boys: George Frederick Albert Thomas or George Oliver Michael Rupert. Okay, I'll stop there. This is way too much fun! (I should have been royal!) Of course, it is not up to me! We shall wait and see what they choose! Place your bets! 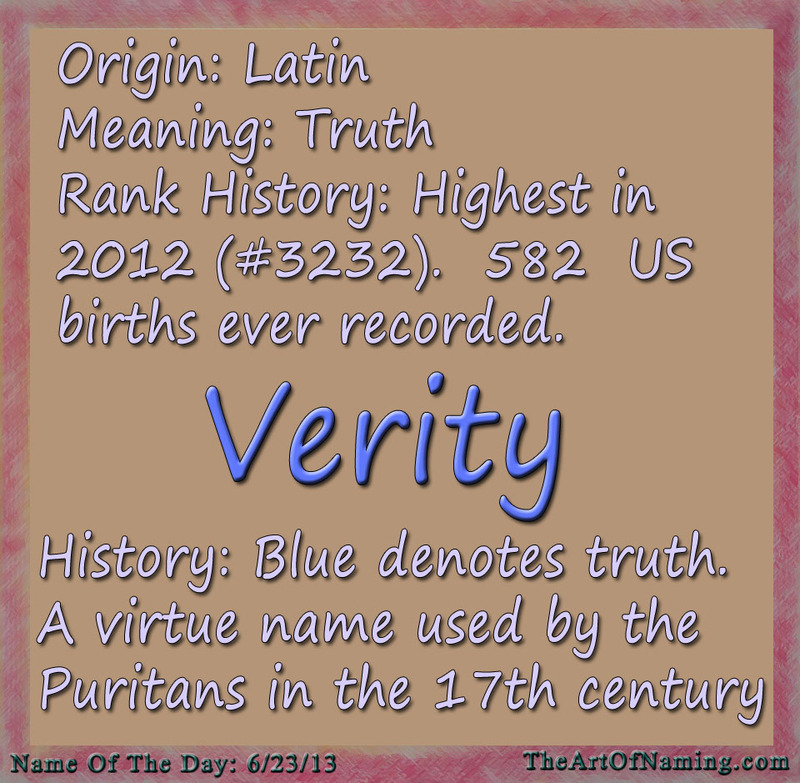 In light of my most recent list of names, today's Name of the Day is a feminine virtue name: Verity. 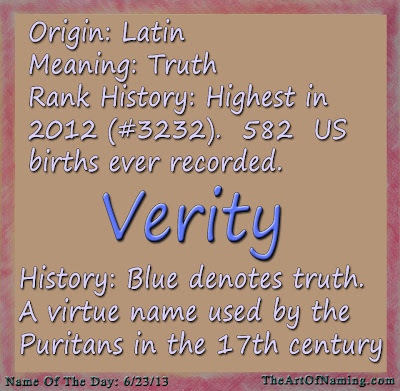 The name Verity is one of the virtue names that originated with the Puritans in the 17th century. They put such value and importance on the meaning of names that they began giving these virtue words as names. Other popular ones are Grace, Hope, Joy and Faith. However, I like to find the more unusual ones. While Verity currently ranks at #360 in England/Wales, it is rarely used these days in the US. 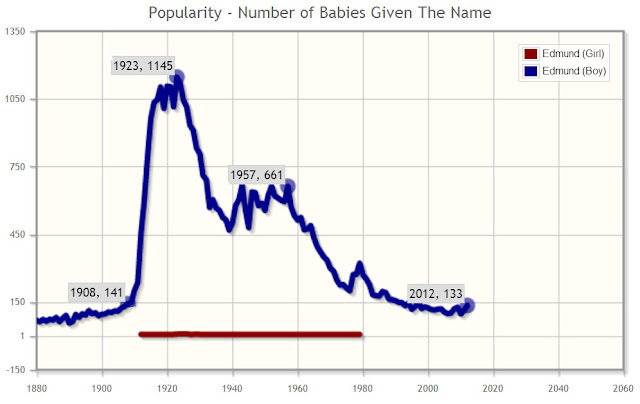 If you're curious about the modern day usage, there have only been 582 baby girls ever named Verity in the recorded US history of names. 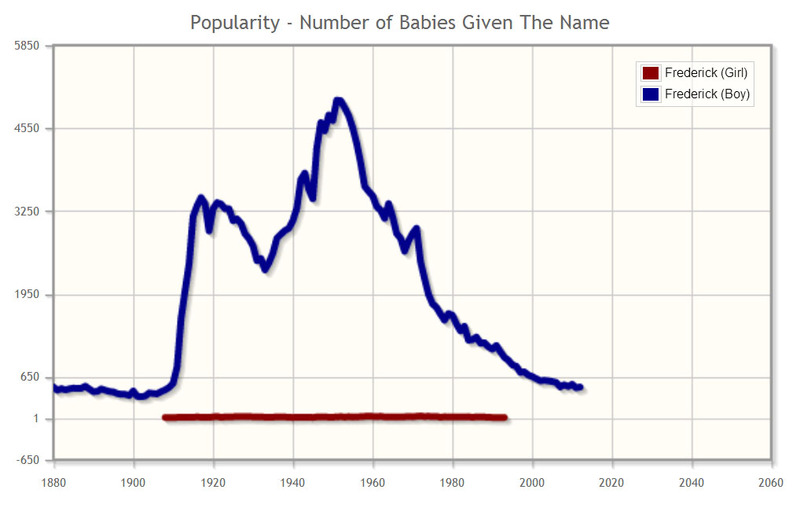 If you use Verity, the chances of your daughter having a unique name are very good! Yet it is not hard to pronounce or unfamiliar! Score! What do you think of this virtue name? Would you use it in the first name spot or the middle name spot? Is this a trend that you like or is it just too smooth? Some people like more crunch to their names. In addition to these liquid names are what Laura coined "raindrop names" that are also smooth with the same type of sounds, but they are shorter. In fact, they pack two or more syllables into four or fewer letters. Included in this trend are the letters M, L, N, R and Y. Examples of names like these are Liam and Mia which both cracked the top 10 last year. Mila, Leo, Eli and Ayla are popular as well as Arya, Noah, Mira and Nora. Do you see the pattern? These types of names are huge right now. In the past, a great example that was highly used is the name Mary. What do you think of Liquid Names and Raindrop Names? Do you like one trend more than the other? Let me know! Today's Name of the Day is Helena. This name is the Latin form of the name Helen, which has a ton of history. Most notably, there is Helen of Troy who was the daughter of Zeus and Leda in Greek mythology. She was kidnapped by Paris and was the cause of the great Trojan War. And a more modern example was Helen Keller who overcame being blind and deaf. While Helen is a strong name, I prefer the girlier Helena. I like to pronounce it Hel-AY-na as opposed to Hel-EN-ah, but both are pretty! 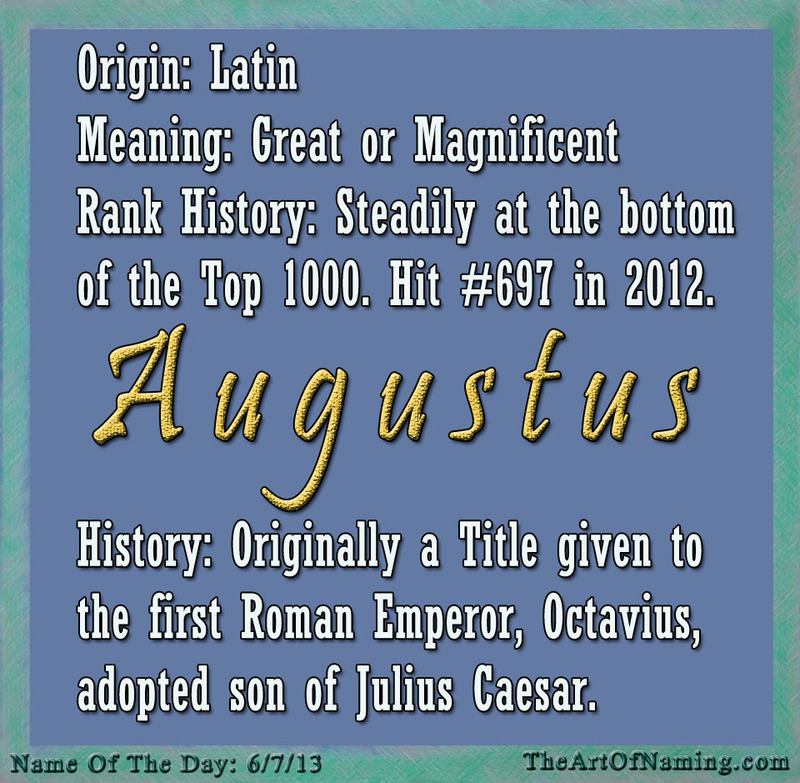 This Latin name means "bright, shining one" which is a lovely meaning. Helena was used for two characters in Shakespeare's works, one in "All's Well That Ends Well" and one in "A Midsummer's Night Dream." 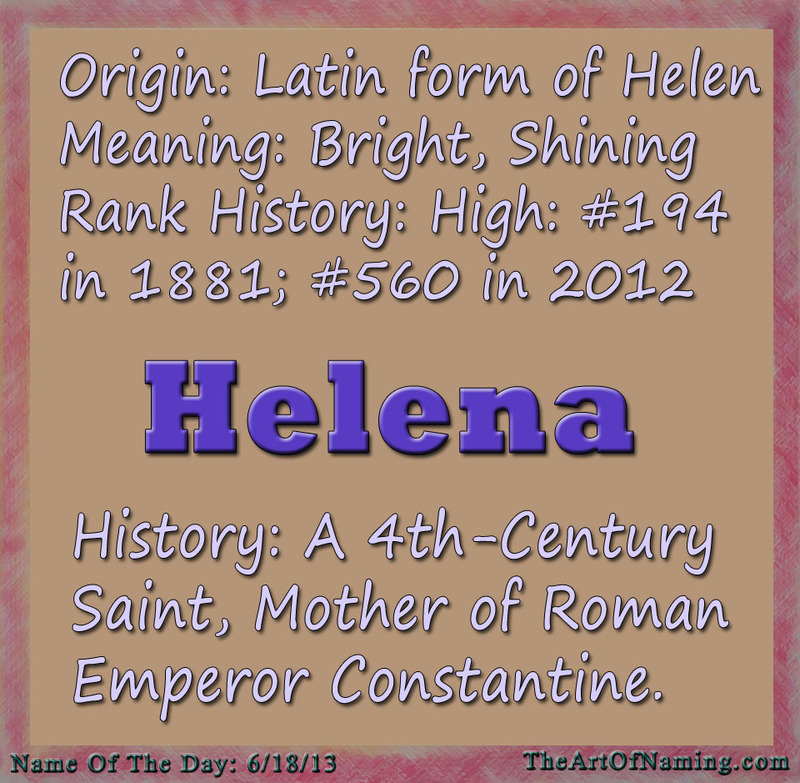 Another Helena was a 4th-century saint who was the mother of the Roman emperor Constantine. The name Helena translates well around the world. In 2012, it ranked at #560 in the US, #328 in England/Wales, #194 in France and #243 in the Netherlands. It is even more popular in Austria (#30), Croatia (#35) Poland (#45) and Belgium (#55). As for Helena's history in the US, it has always been in the Top 1000, except for 1992 when it dipped down to #1008. It has been a fairly consistent name. 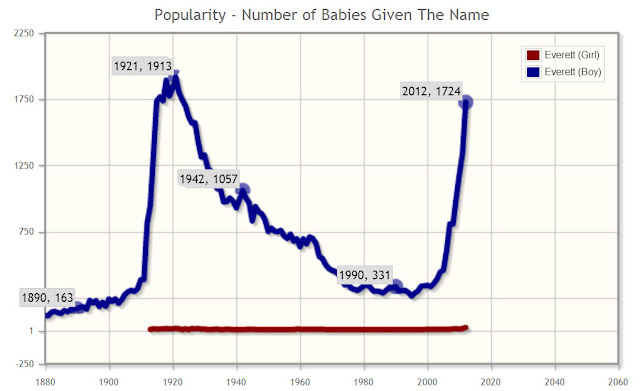 It's largest popularity spikes occurred in 1918 with 488 babies born, and 2006 with 595 babies born. 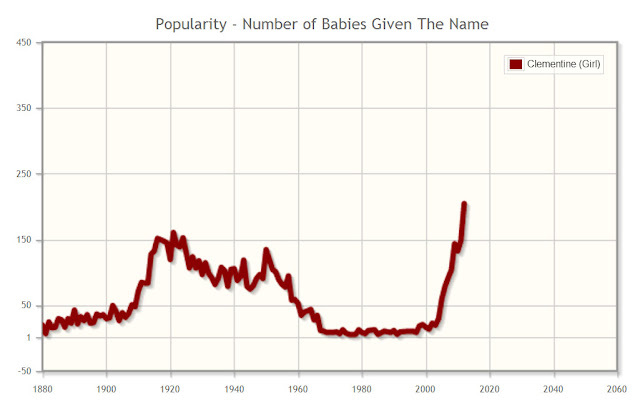 Still, if you consider the 200-500 or so babies born every year named Helena, this name is not very popular when compared to names that spike up to 10,000+ births a year. I would say this is is a very lovely, classic choice that is both familiar but not overly used. What do you think of Helena? How do you pronounce it? Do you prefer Helen or Ellen instead? Let me know below! Today's blog post analyzed the name Elizabeth, so I thought I would go a bit more "classic" than usual with the "Name of the Day.' I chose the handsome Frederick. 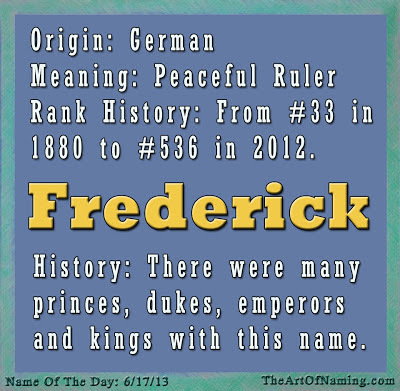 German meaning "peaceful ruler," Frederick is one of those old-fashioned, classic names that nearly disappeared for a while; (how many Freds do you know?) Today, some parents are liking its solid history and classic charm and are reviving it! Of course it hasn't really disappeared. Frederick has comfortably been hanging out in the 300-500 range of the US Top 1000 chart for the past couple decades! It was last in the top 100 in 1957. 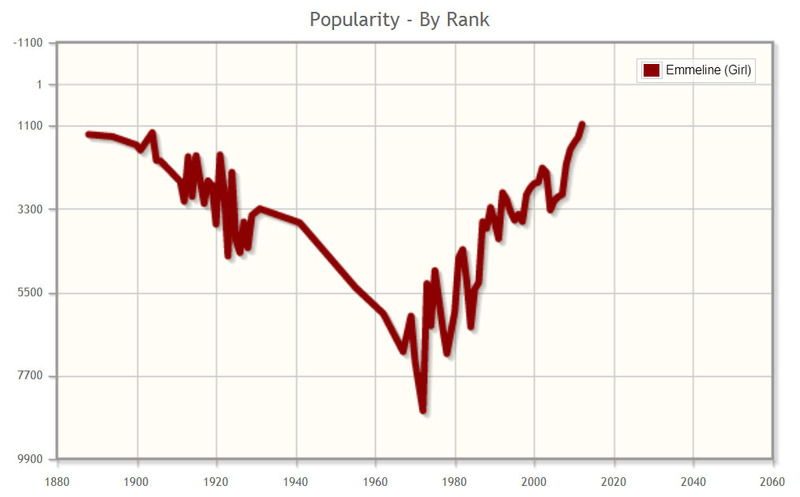 Its largest popularity spikes occurred around 1914 and again around 1946. 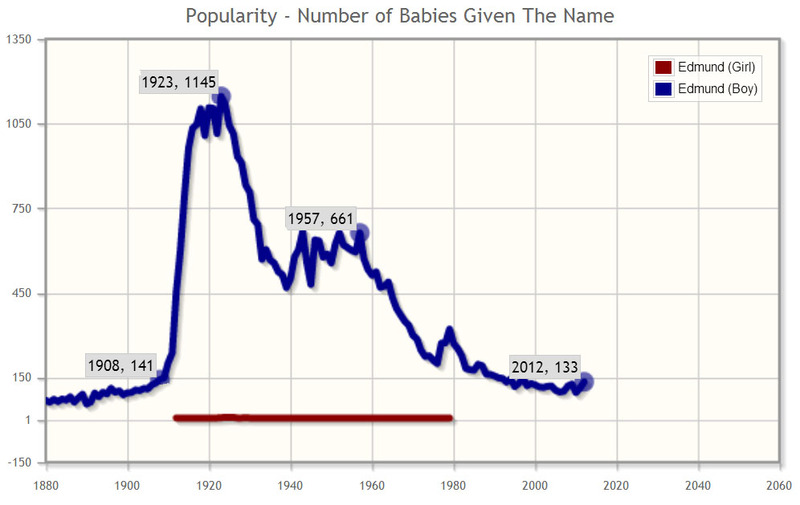 It was most popular in 1951 with a total of 4,982 baby boys born with the name Frederick. It was even rarely but consistently used for girls between 1908 and 1993! 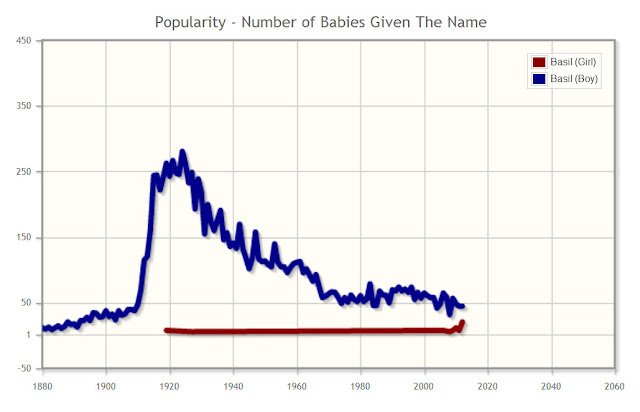 Since the male popularity spikes, the name has fallen back down to respectable levels. 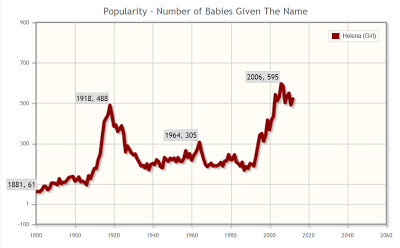 In 2012, there were 482 babies born, which ranked Frederick at #536 on the US Top 1000 chart for boys. What sort of history does this name have? A very extensive one! I can't list everyone named Frederick. There are many ancient emperors and kings who held the name. Click here to view a wikipedia list of all the famous Fredericks. The most notable Fredericks are Frederick the Great who was the King of Prussia (1712-1786), Frederick Douglass who was an escaped slave turned abolitionist (1818-1891), and of course actor/singer Fred Astaire (born Frederick Austerlitz 1899-1987). I had this article prepped up and then a while later I came across this article from Nameberry that was interesting. 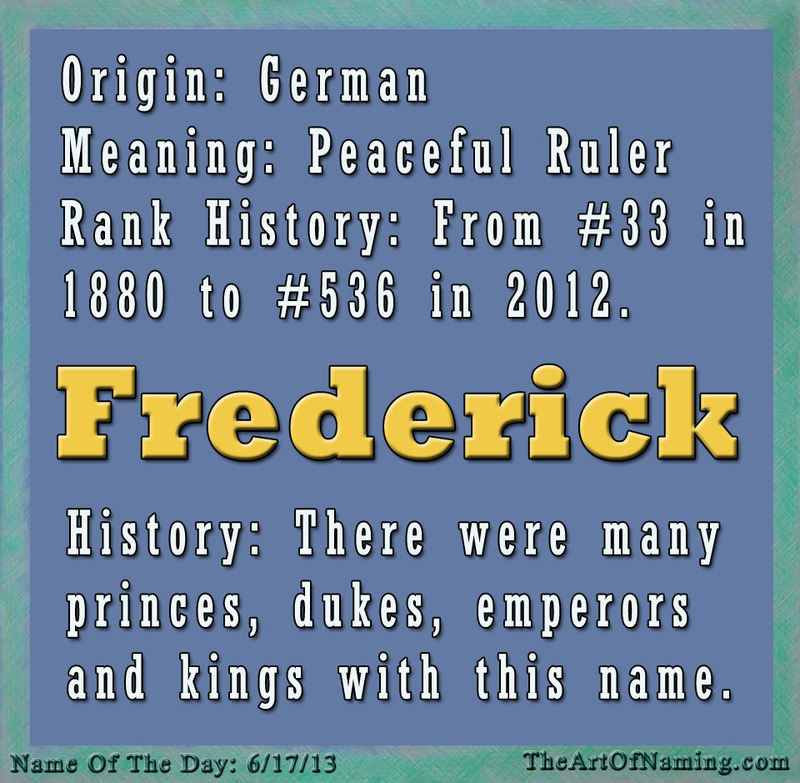 It interviews a man named Frederick and he gives his thoughts on his name and his nickname Fred. What do you think of the name Frederick. Would you call him Freddie/Freddy or Fred? Would you go with another nickname like Red, Fritz, or Rick? Or perhaps Derick/Erick which are derived from the spelling? Maybe good ol' Frederick is perfect is its entirety! Let me know your thoughts below! When pondering classic and even regal names, there is one that almost always comes to mind: Elizabeth. This perpetually popular name surely has a good reason for remaining as such! But what is that reason? Beyond its elegance and beauty, Elizabeth tends to flow very well with many names. This is one of the reasons that it has remained within the Top 30 every single year since 1880. But why does it pair so well? Elizabeth is used for both a first and middle name. People love Elizabeth as a first name because of how versatile the nicknames are, ranging from Ellie to Liz to Betsy to Beth, and many many more in between. In this instance, we shall investigate why Elizabeth works so well as a middle name. 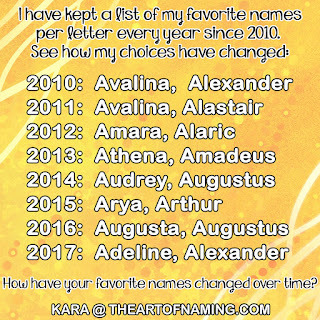 Many people clump it in with all the other "filler" or "connector" middle names that simply fill an empty spot between the first and last names, such as Anne, Grace, Marie, Claire, etc. However, many argue that Elizabeth doesn't deserve to be classified as such. Rather, despite its popularity, it is somewhat one-of-a-kind. 1.) It starts with a vowel, which is appealing, but the "L" tends to get most of the sound emphasis which allows Elizabeth to flow with names that end with a vowel. 2.) The overall stress of the full name is put on the second syllable which helps to connect it to the first with a beautiful flow. 3.) The four-syllable length of Elizabeth makes it long-but-not-too-long. In many cases, four syllables is the perfect length to differentiate it from the first name before introducing you to the last name. For example, Clara Elizabeth Miller tends to roll off the tongue slightly better than a shorter middle name like Clara Leigh Miller. One might hear it incorrectly as "Claralee or Claraly." Whereas Elizabeth makes a bold but graceful stance in its own place. 4.) 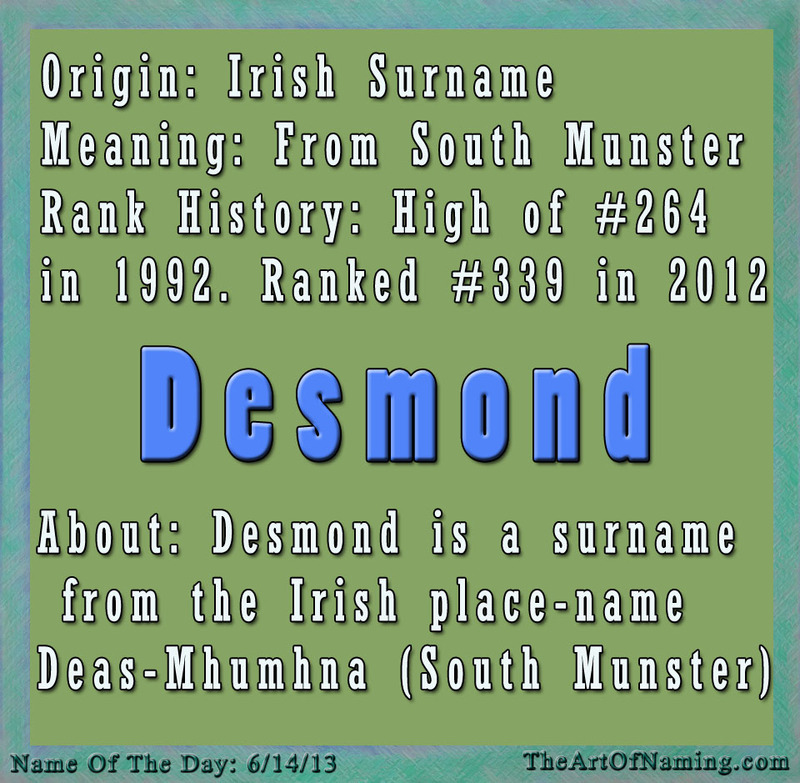 The name ends with a consonant sound that isn't often heard in other names. (How many can you think of that end with -th?) Most first names used today end with -a, -e, -n, -r or -y, which pair perfectly with the different beginning AND ending of Elizabeth. Much of Elizabeth's success is undoubtedly due to the reasons listed above. The combination of them makes this name very versatile yet unique. If you are looking for other options instead of Elizabeth, you'd do well to examine other four-syllable names with the stress on the second syllable. Most of these will also flow very beautifully with almost any first name.Test out your favorite first names with the names below as the middle name, and then try it with Elizabeth. Which do you prefer? If you notice, the majority of these names end with A. If you refer back to my fourth point above, many feminine first names seem to end with A as well. While some parents find the rhyming to be cute, most will agree that Sarah Octavia, for example, is too much A sound. Whereas Sadie Octavia sounds much better. However, because of Elizabeth's different ending, Sarah Elizabeth and Sadie Elizabeth both work. If you are interested in using one of the names listed above, one way to avoid the repetitious endings (like Sarah Octavia) is to end the first and middle names with different vowel sounds. For example, Stella Calliope or Lily Veronica. Also, ending the first name with a consonant helps, like Piper Cordelia or Caitlin Amelia. 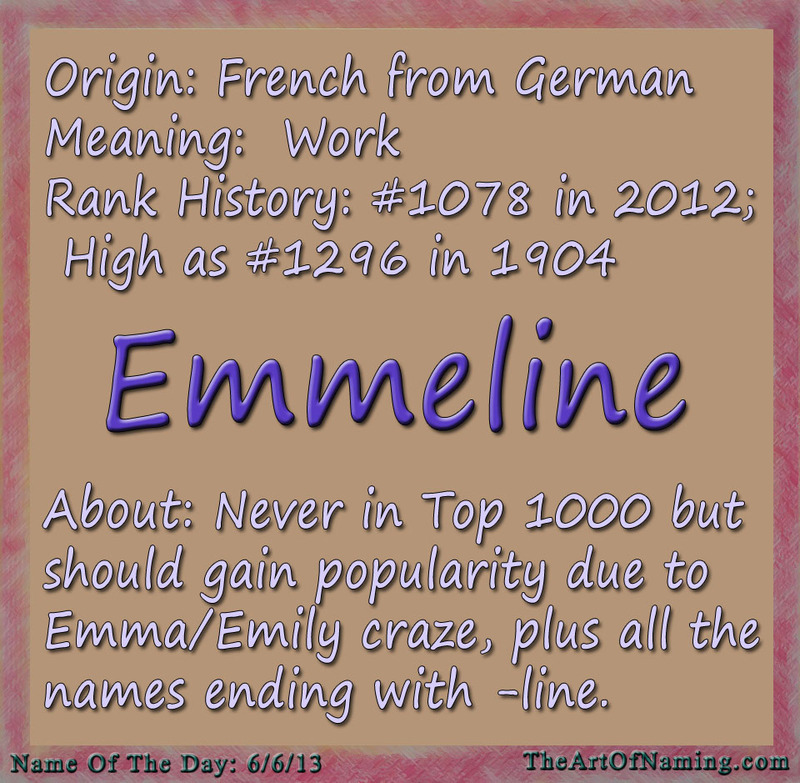 Or use a middle name that ends in a consonant-sound like Evangeline. Sophia Evangeline or Hadley Evangeline work very well! It is clearly all up to interpretation and personal taste. Even different accents may throw this theory off. But there has to be a reason why Elizabeth has remained so consistently used over the past 132 recorded years. 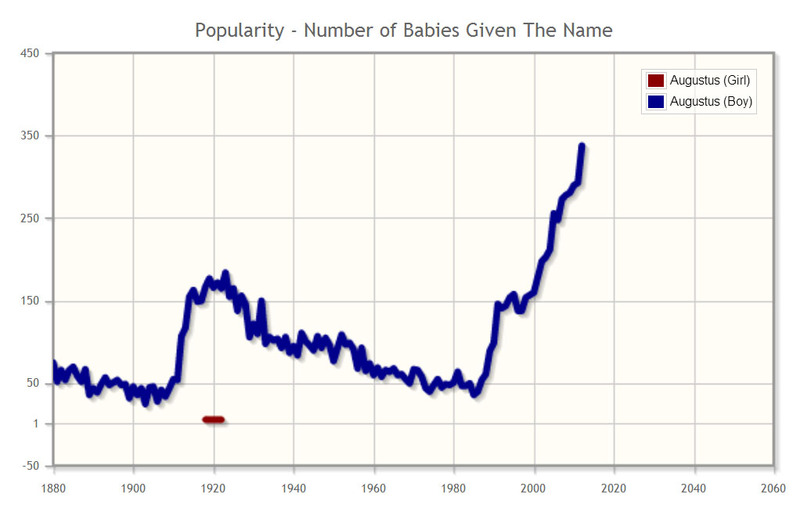 Elizabeth has never ranked higher than #26, and even then there were upwards of 10,000 babies who bore the name. Very few other names in history have stats like this. Do you like the name Elizabeth or would you opt for one of the other options instead? Today's featured name is 11-letters and 5-syllables long. Perhaps that explains why it is rarely used in the US. Did you know that Alexandrina was the real first name of Queen Victoria who went by her middle name? While many parents would opt for Alexa or Alexandra, there is something special about Alexandrina. 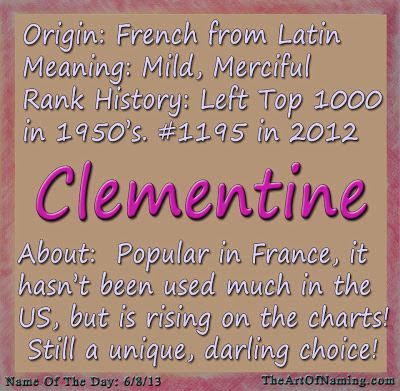 It has a more exotic flair than her sister-names, and would be a beautiful middle name to pair with a short first name. Ivy Alexandrina or Claire Alexandrina are lovely. 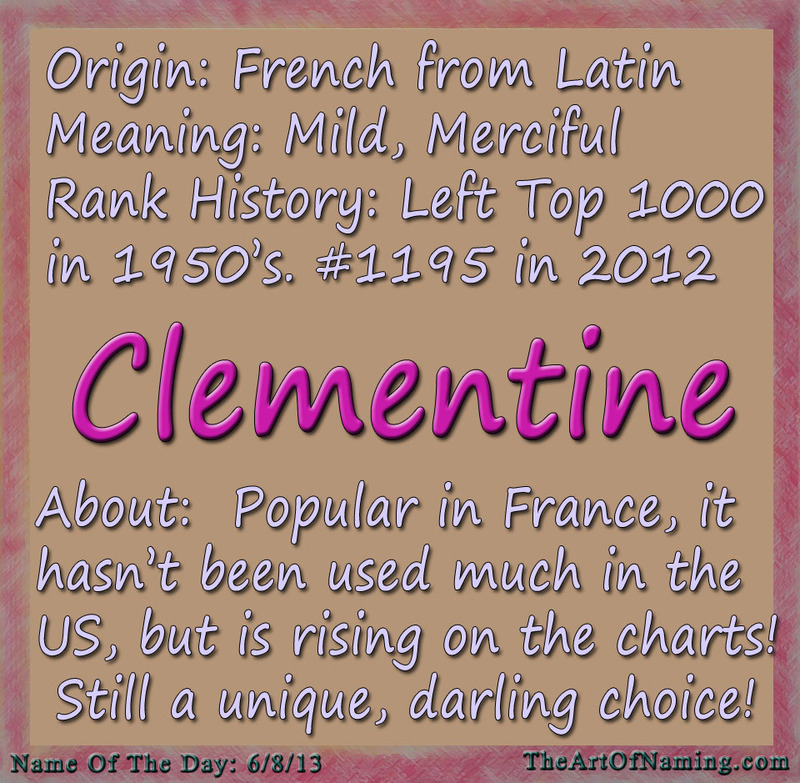 As a first name, Alexandrina Eve. As a plus, it is truly a rare name today, but it is so familiar to the ears because of all the other Alex names. It was first used in 1914, 1915, 1920 and 1921 by a total of 23 girls. After that, there were 5 born in 1935, 6 in 1961, and then it started getting more regular usage in 1975. However, it only sees an average of 5 births per year. 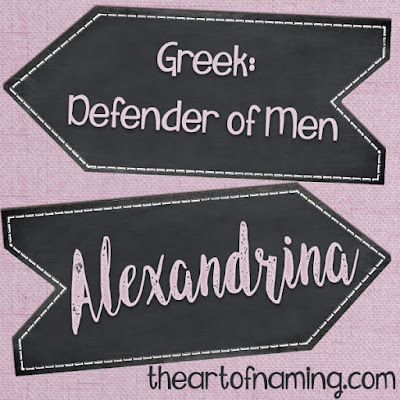 Most recently, there were 9 girls named Alexandrina in 2013, which means this name ranks at #10,965. 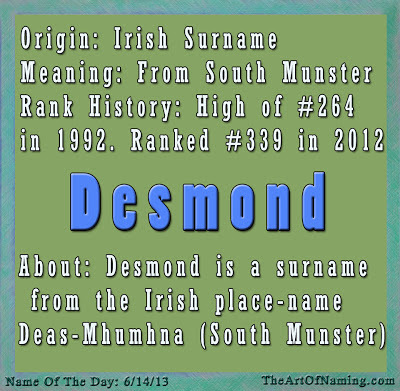 That is far from being the #1 name in the country, but many could be drawn to it because of that. According to records, only 246 girls have ever been named Alexandrina. Talk about rare! In fact, the name wasn't used by at least 5 girls for the year from 2014-2016, meaning that it did not rank during that time. Do you know anyone with this name? Alexandrina is a distinctive choice! It is the Greek variation of Alexandra and also means "Defending Men." Because of its royal namesake, some people have been speculating it as an option if Prince William and Kate Middleton have a girl. It is also a great alternative to the more common royal names that get used today. What do you think of this long, beautiful name? Are 5 syllables just too much or would you consider it? Share your thoughts on this name in the comment section below! Today's Name of the Day might raise your eyebrows at first. 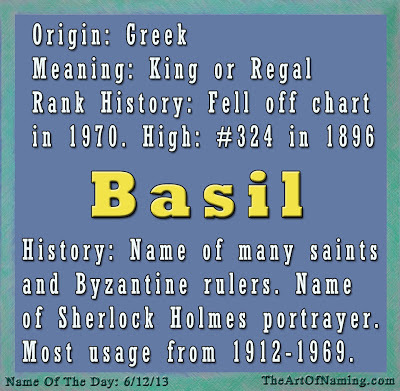 The Greek boy name Basil means "Regal" or "King" and is a quirky choice! The most famous bearer of this name is Basil Rathbone who portrayed the very British Sherlock Holmes in 1939. And of course, many of you probably already thought of the basil herb. It is usually pronounced Baz-uhl rather than Bays-uhl like the herb. From the Greek name Βασιλειος (Basileios) which was derived from βασιλευς (basileus) meaning "king". 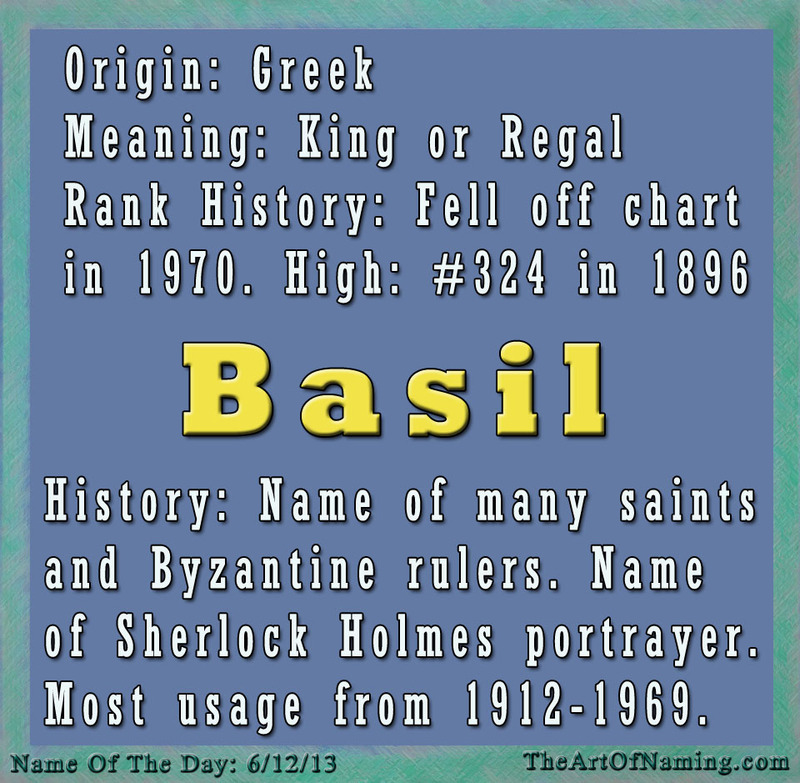 There were many Byzantine Empire rulers named Basil, as well as some Eastern Orthodox saints. Saint Basil the Great was a 4th century bishop who helped to found the early Christian church. Basil is rich in history. Today, Basil has been classified as a very fun name because of the manic Basil Fawlty from the British TV comedy classic "Fawlty Towers." There is also a Disney movie called "Basil of Baker Street" which stars "the Sherlock Holmes of the Mouse World." If you still aren't sold, that's fine. I think this is an interesting name. It is on my guilty pleasures list so I can't blame any of you for not immediately using it for a son. However, there are other variations of the name that are interesting like the Russian Vassily or Vaska, the Ancient Greek Basilius, the French Basile, the Italian Basillo or the Polish Bazyli. What do you think of Basil? Do you get the same unique and quirky, yet old-fashioned vibe that I get? Do you think it will ever be popular again, or is it too fusty? Today's Name of the Day sounds like it should be popular but it actually is not. 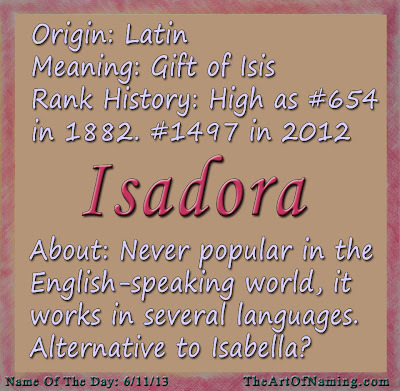 For those parents who love the name Isabella but hate its popularity, have you ever considered the name Isadora? 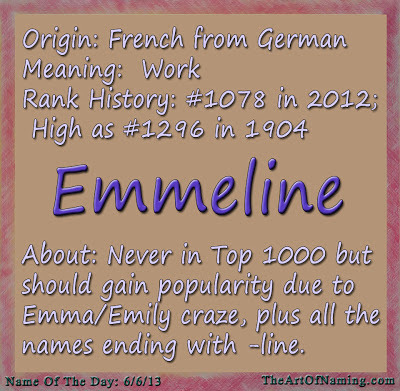 This name has always been around but it hasn't been on the Top 1000 chart since 1900 when it ranked in at #992. The highest rank Isadora has ever received is #654 in 1882, however that only accounted for a total of 9 births. Last year, 2012, there were 148 little Isadora's born. 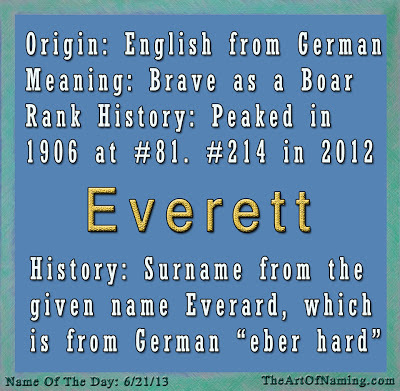 The name just fell shy of ranking, coming in at #1497 which is the highest it has ranked since 1915. In fact, Isadora wasn't used at all from 1958-1968. But, like Isabella who didn't rank at all on the Top 1000 chart from 1948-1990, Isadora has major potential to become something huge if parents are interested in "different but familiar." 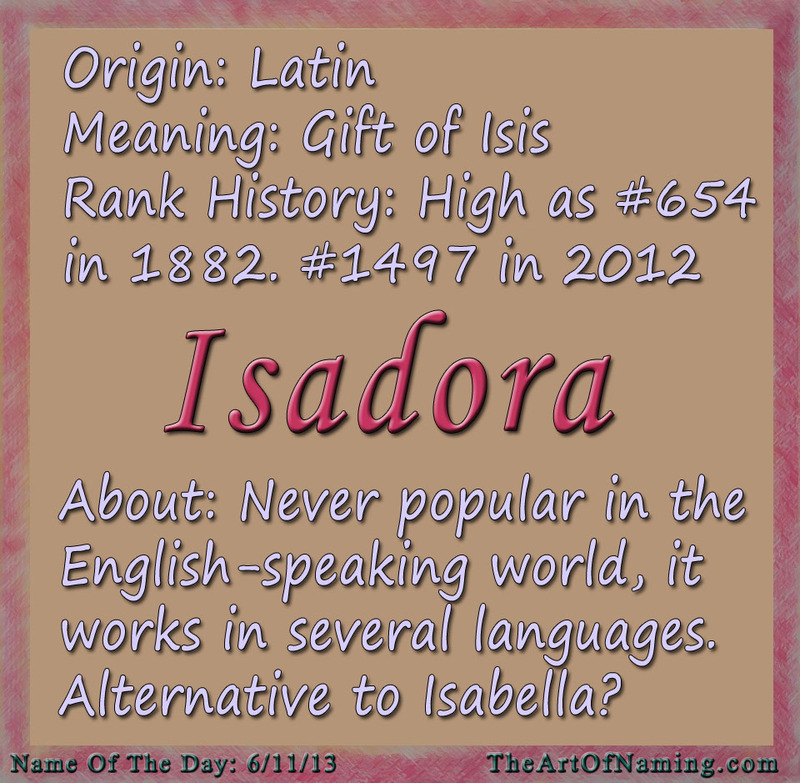 Isadora is Latin, meaning "gift of Isis" and has international appeal. It has been used in many languages such as Serbian, Macedonian, Spanish, Portuguese, Russian, Italian, English and Ancient Greek. Isis was the Egyptian goddess of fertility and birth. The rest of the name comes from the Greek word δωρον (doron) meaning "gift." Male counterpart Isidore was historically popular with Jews who used it as an Americanized version of names like Isaac, Israel and Isaiah. A famous bearer was the American dancer Isadora Duncan (1877-1927). With more and more babies being named Isadora, do you think it will gain popularity? Would you use it as an alternative to Isabella? And do you like possible nicknames Issy, Isa or Dora? Let me know the answers to these burning questions! 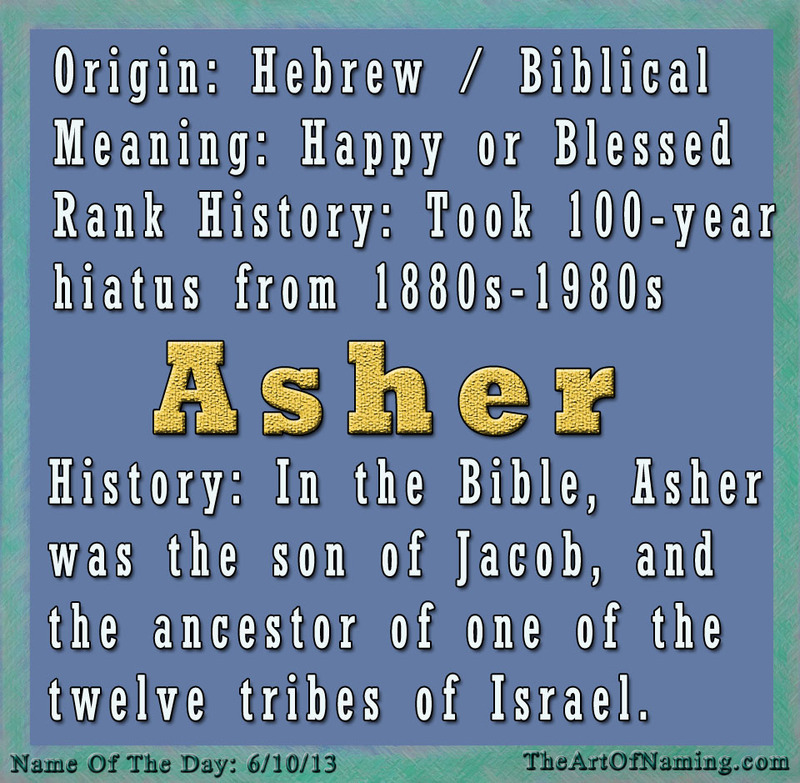 Today's Name of the Day is a soft, handsome boy name from the Old Testament: Asher. 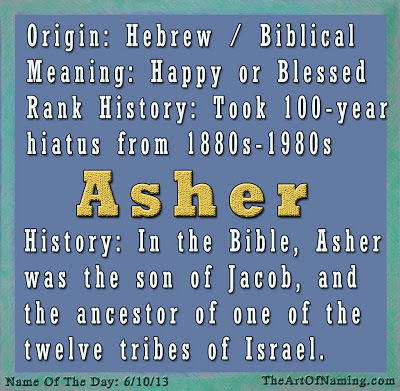 This name is a Biblical Hebrew name meaning "happy" or "blessed." Asher was the son of Jacob and Zilpah, (Leah's handmaid), and he was also the ancestor of one of the twelve tribes of Israel. This name is definitely a favorite with today's parents! It has been climbing up the charts quickly! A very rare name at the end of the 19th century (only 42 boys received this name between 1880 and 1895.) It wasn't heard from again until 1910 and it remained rarely used. 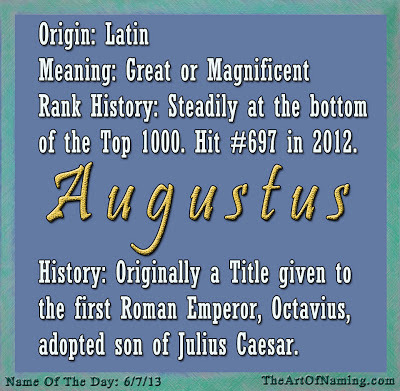 What do you think of this handsome, biblical name? 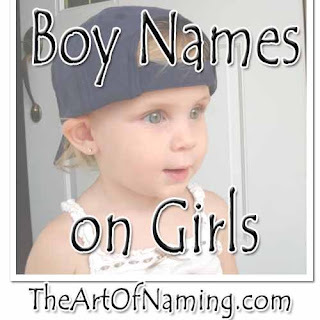 It falls into the new trend of giving boys "softer-sounding" names. Asher is possibly the favorite of the bunch that contain the "sh" sound. And of course, the nickname Ash is appealing! Let me know your thoughts on this name! 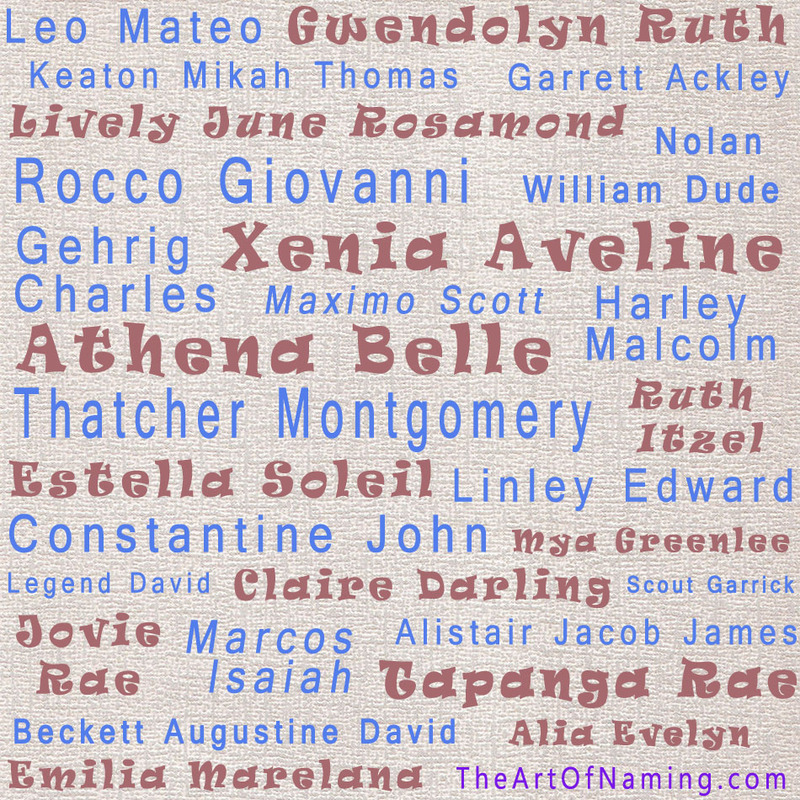 Many parents today choose long, proper names for the birth certificate but they call their little ones by a nickname. 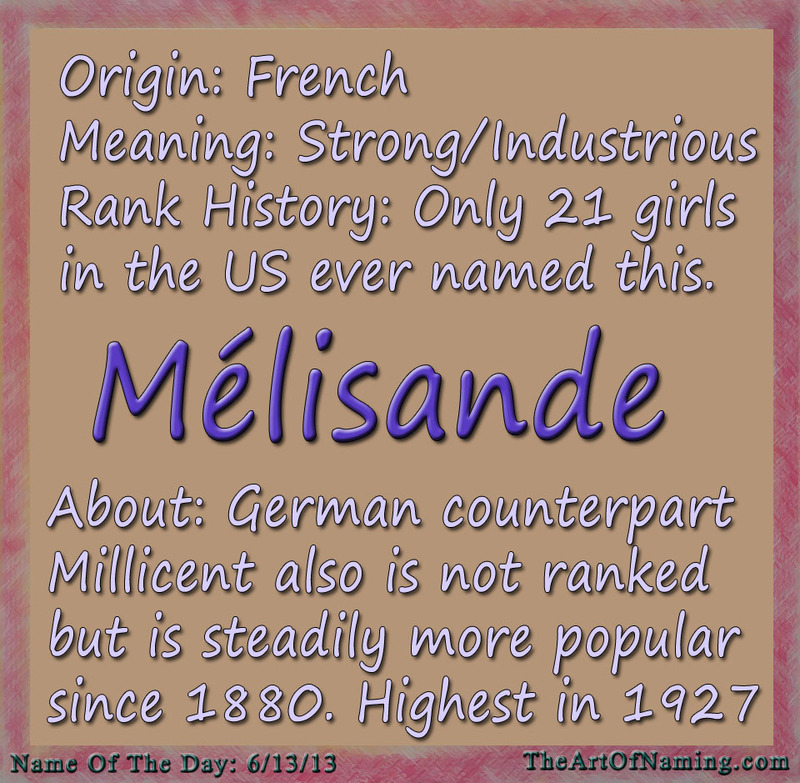 For girls, nicknames that end with -ie have always been popular. For example, perhaps you love the idea of having a little Maggie but you aren't comfortable with Maggie as a given name. What do you do? Name her Margaret. Now, some parents are skipping the proper name and using the nickname on its own. While Maggie is a nickname for a specific name, some "nicknamey-names" could be short for any number of names. What if you wrote Sadie or Callie directly on the birth certificate? And what about names that seem nicknamey but don't have an obvious long-form like Bonnie? In the 1880's, Minnie, Annie, Bessie and Nellie ranked in the Top 20 as a whole name. So it begs the question, which of these nicknames can stand alone today, and which require a proper given name? Of course, there is no right or wrong answer but I will list some of the nicknamey-names that could possibly stand on their own for a modern girl. I will break it down into three categories and put their possible long-forms in parenthesis, if applicable. Of course there are probably many other examples that I missed. 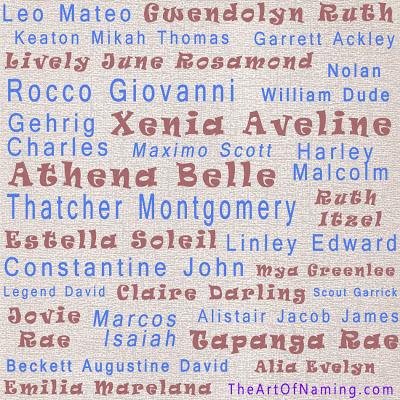 What do you think of the nicknamey-names? Would you use any of these as a stand-alone or do you believe in a proper given name? 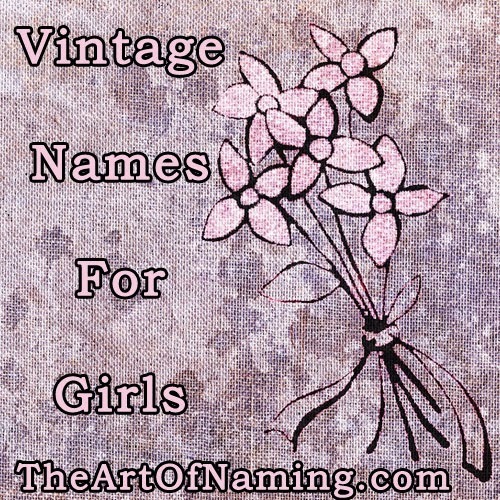 For a longer list of names ending in -ie, take a look at this article: Trendy Girl Names From 1900. 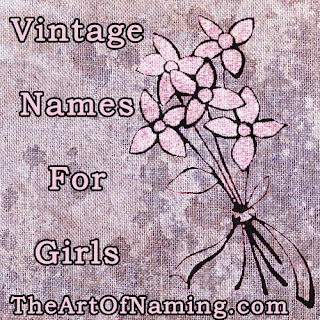 This style of names was actually high-fashion at the time and they were all given names as opposed to nicknames!